The intrigue around the upcoming Karaka Million 2YO (1200m) took another twist at Ellerslie on Sunday where exciting filly Probabeel laid claim to the favourite’s tag for the rich two-year-old dash on January 26. The Brendan and Jo Lindsay-owned Savabeel youngster launched a devastating late sprint to take out the NZB Insurance Pearl Series sponsored 1200m contest, in the process downing stablemate Yourdeel, also a Karaka Million candidate. 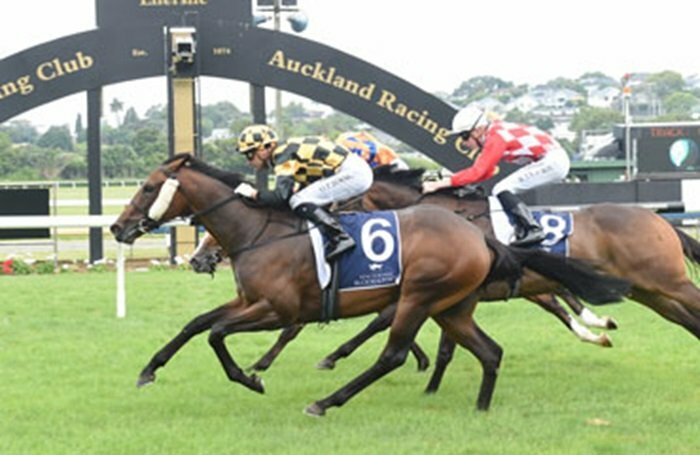 Trained by Jamie Richards from his Matamata base, Probabeel had been impressive when winning at Ellerslie at just her second race-day start last month. Sent out the warm favourite for Sunday’s contest off the back of that run, Probabeel looked to be in a little trouble approaching the home turn when still a fair way off the pacemakers in the eight-horse field. Bosson took the filly to the outside to make her challenge, where she joined in over the last 100m to storm to victory by a head from Yourdeel with Hasstobegood a neck further back in third. Bosson was impressed by the performance of Probabeel although it has left him with a dilemma on which horse he will ride in the Karaka Million, as he is also the regular pilot of Aotea Lad who tops the order of entry for the event. “We got a bit off them and it took a bit to wind up but that last 100m was awesome,” he said after the race. “I wasn’t too worried as I managed to get out into the three-wide train just before the turn. “She just took a little while to wind up so maybe a set of blinkers might be going on for the Karaka Million. “There are some lovely horses I get to have the choice of (for the Karaka Million) so it’s exciting times. Owner Brendan Lindsay admitted he was left a little dumbfounded by the win after believing his filly had too much to do in the concluding stages of the race. “I thought she had no show as she looked like she might run third at best with 50m to go,” he said. The Lindsays could have two runners in the Karaka Million with Louis Luck, who was successful on debut at Trentham on Saturday, also likely to make the final field for trainer Jamie Richards. Richards has six two-year-olds qualified for the Karaka Million, a race he has taken out for the past two years with Melody Belle and Avantage respectively, when training in partnership with Stephen Autridge.